Waiting lines for Amsterdam attractions can be terribly long - up to two hours. 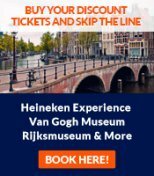 But if you book your Amsterdam tickets here, you can skip the waiting lines and get a unique discount of up to 10 euros per ticket. We are happy to announce a new cooperation with an Amsterdam ticket which has exlusive discount deals with most attractions - and you don't have to be in line. Also, they offer special combinations deals (e.g. a top museum in combination with a canal cruise or tour) which gives you an extra discount. We have listed the most popular options here. These include the popular combination tickets: entry to a top attraction like the Van Gogh Museum or Anne Frank House in combination with a canal cruise. Also includes the Heineken Experience. Besides the popular options, you can also book discount tickets here to the less beaten paths. A tip: try the National Maritime Museum (Scheepvaartmuseum) - this is the museum where school teachers take their teenage pupils. Next to the popular Heineken Experience and Madame Tussauds, you can also book here for the Amsterdam Dungeon, the beer bikes (bikes that carry around 10 people and have a beer tap installed), the hop-on-hop-off buses and the likes. If you have children under 12, check out science center NEMO, founded to make youngsters enthousiast for science. This is the place if you want to make day trips to places outside Amsterdam including to Belgium. Two tip: in the open air museum Zaanse Schans you can see e.g. a whole row or working wind mills (including sawing milss and paint producing mills). And in Delft, you can see a lot of Dutch history coming alive - our national founder Willem van Oranje hang out here a lot. Canal cruises sound touristy, but they are actually a great way to explore Amsterdam as almost every spot in the old city center can be reached by boat. That's why the hop-on-hop-off canal boats might be a good choice. Amsterdam isn't called the "Venice of the North" for nothing. The candle light cruises are highly recommended, too. If you like nightclubs, you can get a dirt cheap single entry ticket here (valid for a week) for 8 nightclubs at the Rembrandtplein and Leidseplein, which are the main squares for going out anyway. If you're into classical music, the orchestra of the Concertgebouw is seen as one of the best orchestras in the world. You can also book dinner cruises here. Our favorite way of exploring Amsterdam is the way the Amsterdammers do it themselves: by bike. Amsterdam has more bikes than inhabitants, and there's a whole system of special bike lines throughout Amsterdam. Get discount tickets here for various bike tours.